Andrea Scraper(Seminole/Muscogee/Creek) is Trainer for the Wellbriety Training Institute and a strong supporter of the Wellbriety Movement. Andrea has helped train and bring the Wellbriety message to many tribal communities, state and private prisons, treatment centers, government agencies and many other individuals and communities. 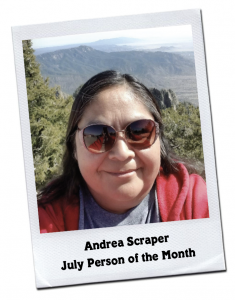 In addition to being a WTI Trainer, Andrea has degrees in Arts-Sociology with a Substance Abuse Studies option from the University of Central Oklahoma and Alcohol and Substance Abuse Counseling from the Oklahoma State University. Andrea also has experience in helping individual transition from inpatient treatment to sober living, assisting with the implementation and operation of the Muscogee Creek Nation Reintegration Program for offender reentry, the first Native tribal reentry program and helping create the Seminole Nation of Oklahoma Methamphetamine and Suicide Prevention Initiative. Andrea believes in building strong communities. Andrea not only believes this but also leads by example by helping facilitate a weekly Wellbriety Meeting to help others find the Red Road. She also recently led a #WhitebisonWellbrietyWebinar on ‘Implementing Circles and Community Mobilization’. During this webinar she discussed how Circles of Wellbriety can evolve into teams committed to bringing healing to their communities as well as themselves. 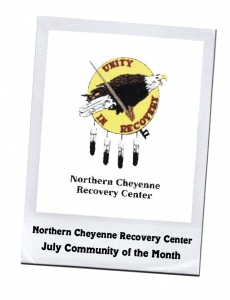 The Northern Cheyenne Recovery Center (NCRC) is a comprehensive outpatient treatment program that specializes in the treatment of substance, drug and alcohol abuse of Native Americans. The NCRC is part of the Northern Cheyenne Tribal Board of Health, Behavioral Health Department and is located in Lame Deer, Montana. The NCRC believes that sobriety is a ‘way of life’ and is a strong advocate of the Wellbriety Movement. Their program is unique in that they incorporate Native American culture in their outpatient, inpatient and continuing care programs and treat both adults and youth. The NCRC includes culturally-based Wellbriety curriculum, including the Medicine Wheel and 12 Steps Mending Broken Hearts, Warrior Down/Recovery Coach and ‘The Red Road to Wellbriety: In the Native American Way’. They also incorporate traditional Native American healing practices and wisdom from Native American Elders into their programing. The NCRC also works to raise community awareness by offering several classes that are open to the public. These classes cover a wide variety of topics ranging from relapse prevention to substance abuse to parenting. In addition, the NCRC will also coordinate interventions for individuals who may have substance abuse problems. They also organize events to build community, such as the ‘Two Teepee Prayer Meeting’, serving meals to those in need and their annual Family Wellbriety Campout.